As promised in a previous blog entry, here is a recap of the X'06 event. Held at the Brant House, all the invitees to the invite received a nice gift bag consisting of a custom Xbox 360 faceplate (got mine autographed by Larry Hryb a.k.a. 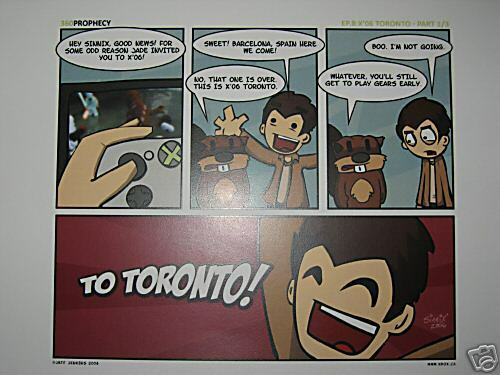 Major Nelson), a Gears of War poster and a 360 Prophecy Comic Strip Print. There was large display of upcoming Xbox 360 games were shown, including games from EA, Sega, Astivision, Epic, Ubisoft and Microsoft. In addition, some of the newest Xbox 360 hardware was showed/demoed, including the Xbox 360 HD DVD Player, Xbox Live Vision Camera, Xbox 360 Wireless Racing Wheel and the Xbox 360 Wireless Headset. There was also a demo of the XNA development platform. 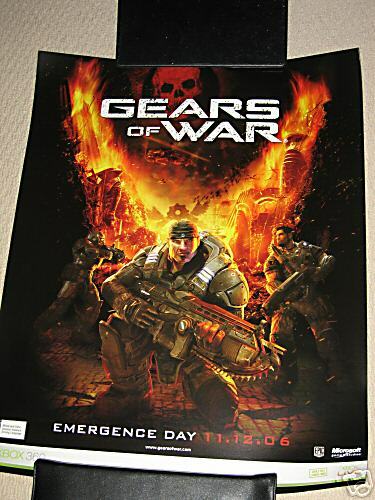 Perhaps the game with the most buzz was the upcoming Epic Game, Gears of War. A teamplay demonstration was set up, so 2 teams of 4 players could play against each other. I got to meet up with quite a few people in the Xbox Live scene, including Larry Hryb, a few Microsoft MVPs, Jerry O'Flaherty and Mark Rein from Epic Games and my Canadian MVP lead, Sasha Krsmanovic. Peter, Gary and I were also interviewed as part of Jean-Luc David's soon to be released podcast. At the end of this event, there was a draw for special Gears of War faceplates and the upcoming Xbox 360 HD DVD Player. Peter Near, a fellow Media Center MVP, won one of these Gears of War faceplates, and my brother, Gary Tsang, another Media Center MVP, won the big prize of the night, a Xbox 360 HD DVD Player. I must say, my brother has won way too many things through random draws for it to be statistically 'random'. When I took this picture of Gary, little did he know that that would soon be his Xbox 360 HD DVD Player. To see the rest of the pictures, check out my X'06 Canada smartset over at Zooomr. All in all, it was a fun event, even if I left without prizes. Thanks Microsoft and all the other companies that helped to make this event a success. cool pics. How'd you score an invite? My MVP Lead was the person who hooked me up.